Help your church team get completely organized for a successful year! Do you value your church volunteers? Do you value your Church Volunteers and Team Leaders? They’re coming… Are you ready? They’re coming – new visitors to your church! Our customers have told us how much they love Excellerate, all of its powerful features, and the ability to customize it to meet their specific needs, but many of them needed the ability to access the program from Macs, iPads, and from home. Church Database Software – What Should it Track? It can be surprising how much information and scattered details a church needs to keep track of on a weekly and even daily basis. New Check-In Hardware available! We’ve just released two new hardware options for our Check-In system. If you’re looking for a mobile solution, you might be interested in our new 10” tablet that can work with a wireless label printer! Now your volunteers can have the freedom to walk around without being tied down with wires and cables. With the option to have labels print wirelessly, you could even have them print out in the classroom as they walk in. 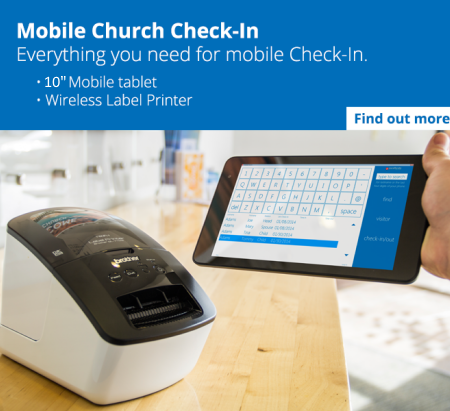 Mobile Check-In is a great option for churches that don’t have the convenience of a permanent building or even just for those who want a more relaxed Check-In environment. And if you don’t need labels, our Mobile Check-In is perfect for events or special services where you can quickly get each person’s name as they walk in the doors. Check scanning drastically speeds up data entry! Entering weekly contributions into the computer may not be the funnest way to spend your time, yet it is critical to the operation of your church! Now you can use a check scanner to drastically speed up the process of entering contributions! Instead of looking up contributors manually, you simply scan their check and it will automatically find the appropriate person in your database. All you have to do is enter the account designation, and amount! The check images are also stored for you, so you dont have to make copies anymore.